When you’re not home, nagging little doubts can start to crowd your mind. Did I turn the coffee maker off? Did I set the security alarm? Are the kids doing their homework or watching television? With a smart home, you could quiet all of these worries with a quick glance at your smartphone or tablet. You could connect the devices and appliances in your home so they can communicate with each other and with you. Any device in your home that uses electricity can be put on your home network and at your command. Whether you give that command by voice, remote control, tablet or smartphone, the home reacts. Most applications relate to lighting, home security, home theater and entertainment, and thermostat regulation. 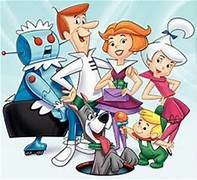 The idea of a smart home might make you think of George Jetson and his futuristic abode or maybe Bill Gates, who spent more than $100 million building his smart home. Once a draw for the tech-savvy or the wealthy, smart homes and home automation are becoming more common. What used to be a quirky industry that churned out hard-to-use and frilly products is finally maturing into a full-blown consumer trend. Instead of start-up companies, more established tech organizations are launching new smart home products. Sales of automation systems were expected to be in 2015. By 2017, that number could balloon to $44 billion. 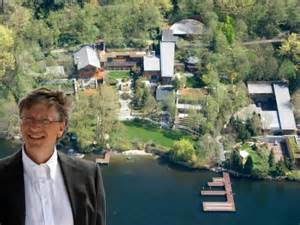 Microsoft Chairman Bill Gates’ home just outside of Seattle, Wash., might be the most famous smart home to date. Everyone in the home is pinned with an electronic tracking chip. As you move through the rooms, lights come on ahead of you and fade behind you. Your favorite songs will follow you throughout the house, as will whatever you’re watching on television. You can entertain yourself by looking at Gates’ extensive electronic collection of still images, all available on demand. The chip keeps track of all that you do and makes adjustments as it learns your preferences. When two different chips enter the same room, the system tries to compromise on something that both people will like. WITH AN IN-HOUSE DESIGN TEAM TO GIVE IT THE LOOK YOU WANT!! BRAINS AND BEAUTY? WHAT MORE COULD YOU ASK FOR? When working with an architect or building designer, you spend a lot of time massaging the design to ensure it’s just right. Clients typically get fixated on elements such as the flow of the design, storage solutions, the size of rooms, floor finishes and window styles, to name a few. But underneath those higher-level decisions is a collection of smaller considerations that also need to be specified and clarified in some way. Dozens of things are represented on a floor plan, or simply assumed to be included because they just seem obvious, but aren’t dealt with in sufficient detail to ensure that you and your builder are on the same page. And when that happens, you’re more exposed to inaccurate quotes, build-stage cost variations, builder’s margins and budget blowouts. 1. Wall tile. This is a great example of an item that, while rarely shown on a drawing, is assumed to be included in the builder’s quote. It’s important that both the cost of the tiles and the extent to which they will be used is clear. 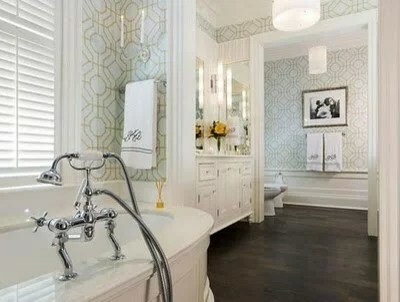 For example, you’ll need to know the cost per square foot that has been allowed for the tiles (for both floor and wall), as well as whether the wall tiles have been quoted as full height, half height or even skirting tiles only. 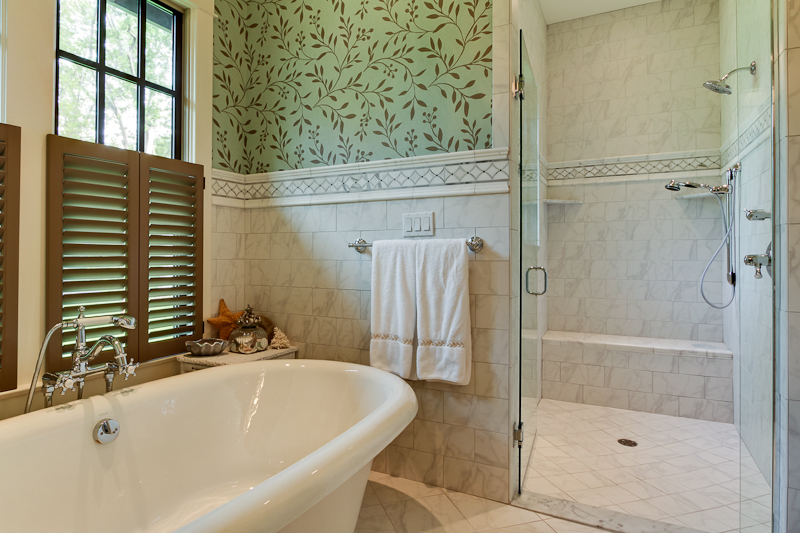 This may well vary from one bathroom to the next, so take the time to set out your expectations room by room. 2. Internal doors. Doors are pretty easy to identify on a floor plan, so there should be no confusion about how many are required. However, there are many considerations when selecting doors, which can affect the cost significantly. How wide and high are the doors? Are they plain or paneled, and will they have a painted finish or do you want wood veneer? Getting your head around as many of these considerations as possible will help you avoid extra costs during the build. 3. Woodwork and Trim. 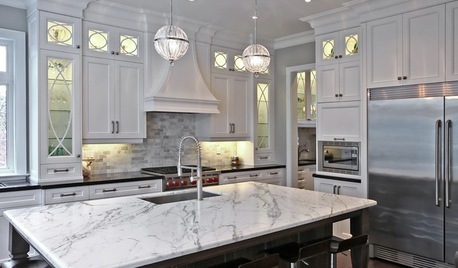 Cabinetry is no longer confined to the kitchen. 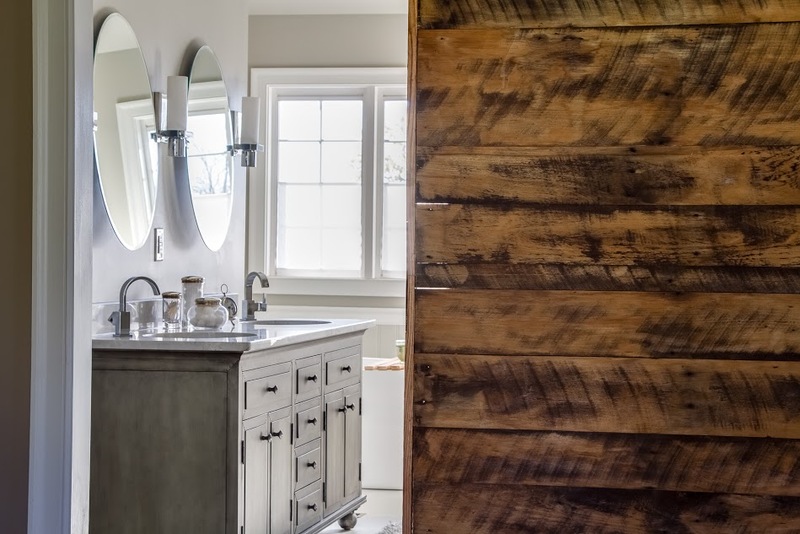 Homeowners increasingly want built-in cabinets for storage and display solutions in all manner of places, including bathrooms, laundry rooms, bedrooms and living spaces. Woodwork should be easy enough to identify on a floor plan; however, given that there are so many options in terms of color, material, fittings, design detail and hardware, it’s important to keep the line of communication open with your builder and stay within your budget. The truth is, unless there are detailed drawings available for cabinetmakers to quote from, the builders can only guess at what the cost might be. At Wolford, we offer the help of an interior design team to develop detailed drawings for quoting and specifying an allowance in your plan. 4. Closets. Custom closets are a must-have for many bedrooms these days. But there are many options for actually fitting out a closet, from DIY wire racks and shelves to high-end custom cabinets. We tend to focus on how big the closet is and often neglect the details of how it will be used. We work to ensure more accurate quotes by including details in the drawings. 5. Lighting. Lighting is one of the most common items to cause a budget blowout, and there are several factors that contribute to this. First, it’s rare that an electrical plan is completed at the quoting stage. Second, because many people are unaware of the lighting options available (and the associated costs) when quotes are being prepared, they haven’t yet put enough time into considering their choices. This can lead to the cost being underestimated in terms of number and type of lights. Make sure you visit a showroom in the early stages of your project to be better informed about your budget. 6. Flooring. A good plan will indicate the intended floor finish, be it wood, tile, polished concrete or carpet. However, when it comes to other flooring types, wood in particular, you’ll need to make selections or allowances for the supply and installation of your preferred type of wood in order to avoid nasty surprises and cost overruns. For example, wood flooring can be a rather generic term when we consider that it may include wood laminates, floating wood floorboards, bamboo and traditional strip flooring. With such a wide range of products and costs, it’s important to understand what the builder has allowed for. Our standard is a sand and finish floor, however some engineered woods can easily double this budget. 7. Decking. Despite decks’ popularity, key information on them is often missing from a plan. 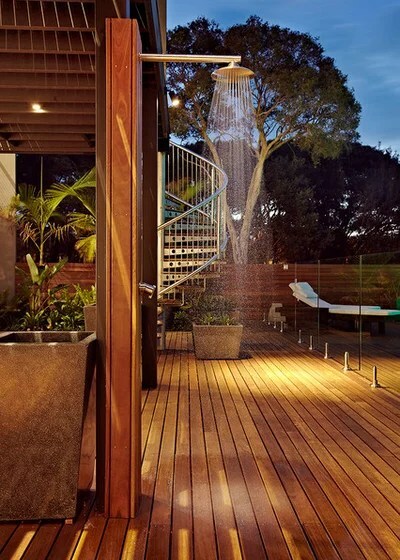 There are many types of decking boards available, including domestic and imported hardwood, composite material and treated pine, and each of these is also available in different sizes. The costs can vary dramatically, so if you have something specific in mind, you must ensure that your drawings specify your preference. You might also want to consider the attachment method used, with nails being the fastest and cheapest option and stainless steel screws being the most secure, long-lasting and expensive. Decks can be relatively pricey structures, so it’s important that you set out your requirements in as much detail as possible so that when you compare a number of quotes, you are confident that you are comparing apples with apples. 8. Retaining walls. These don’t get much love, either. They’re certainly not as interesting as kitchens and custom woodwork, yet they still need consideration during the design stage so they can be included in the quote. 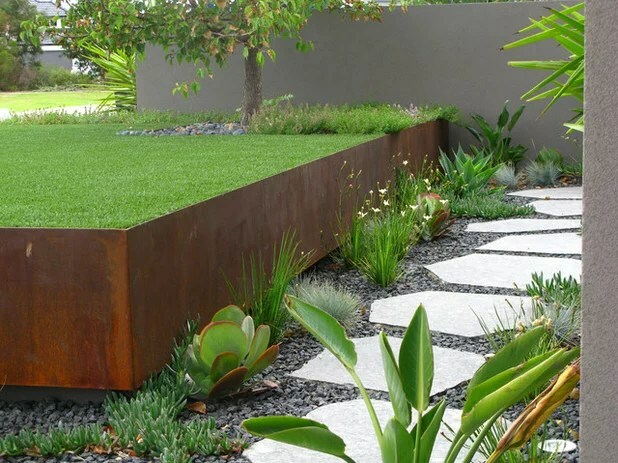 For any lot with even a modest slope, you will probably need to put some thought into the location, height and type of retaining walls. It’s not uncommon for builders to exclude them from the quote as they are often considered landscaping items; however, at Wolford, we believe them to be an integral element of the entire site. To avoid many of these surprises hire a trustworthy builder who has a reputation for including these items in your original quote…like Wolford!! THANK YOU HOUZZ FOR GREAT IDEAS!!! Would you like to build your dream home or remodel your home into a dream? Wolford has an in-house design team to help at no additional cost to you!! Sometimes, when I need a little inspiration I screen shop. You know what this is, it is electronic window shopping. And I save things. I don’t “pin” them because their is no common denominator except that I just LOVE them. It is Valentines Day! What a perfect time to share a few of my design inspirations, maybe you too will see something you LOVE…..
Japanese-style standing bar made of burl wood. Golden demilune escutcheon is elaborately engraved with extending curled ormolu and mirrored to create a central circle. Interior is mirrored with three glass shelves. 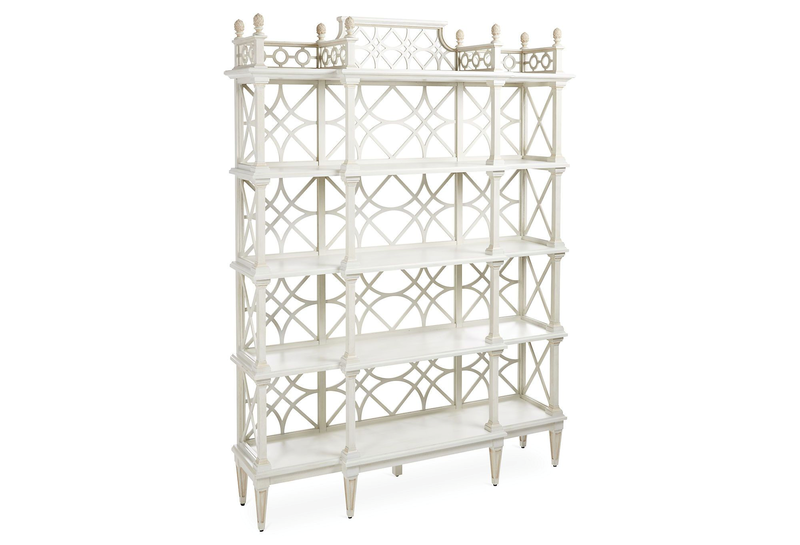 The cabinet base has a shell and acanthus motif and is supported by acanthus-draped Queen Anne-style legs. 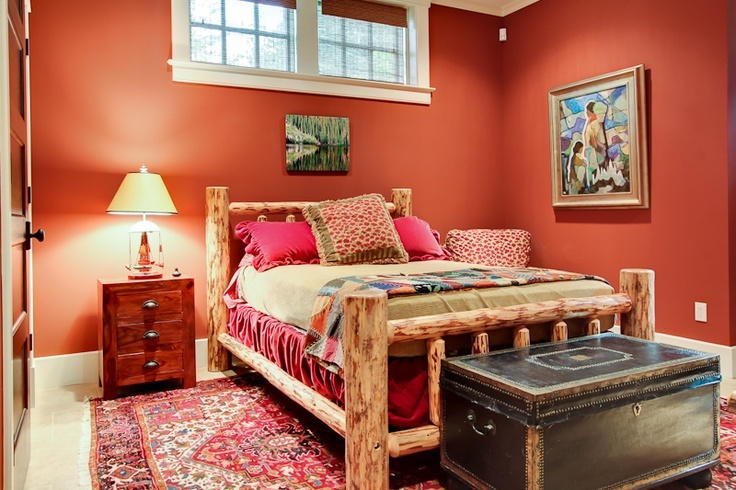 Refinished and lacquered by Mission Avenue Studio in Heritage Red from Benjamin Moore. Made in England. Don’t love this? Need a drink? For an instant infusion of glamour, look no further than this handcrafted settee. 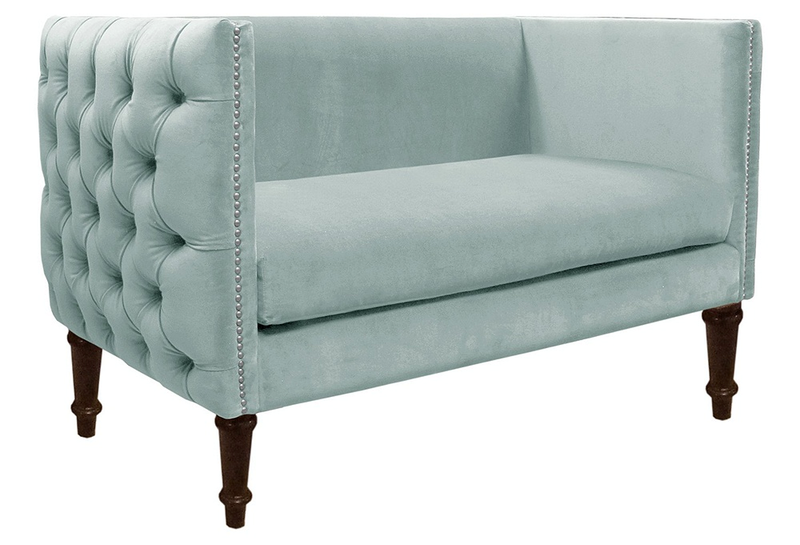 Vibrant upholstery, a classic tuxedo silhouette, graceful sculpted pine legs, and nailhead trim harmonize to stellar effect. Handcrafted in the USA. 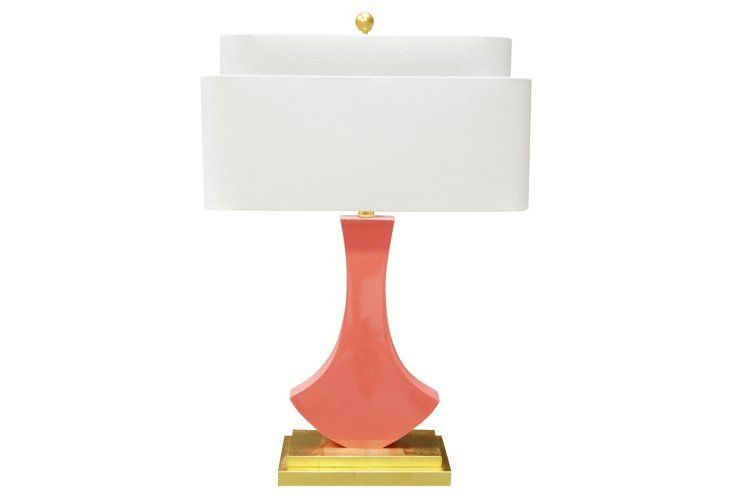 A high-gloss coral lacquered body rises from a double-step base in gold leaf to a striking double-layer rectangular shade in white linen. This geometric lamp packs incredible visual interest into a slim profile–perfect on a table to keep most of the surface free. Artisan-crafted in Vietnam. 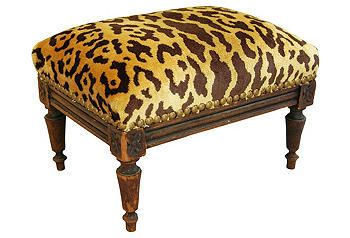 Vintage carved wood footstool newly upholstered in Scalamandré Leopardo gold, black, and ivory cut silk velvet fabric, accented with brass nailhead tacking. Imagine your perfectly pedicured feet resting on this overstuffed stool fit for a queen. Light wear to wood clearly marks a history but it is definately saying LOVE ME NOW! 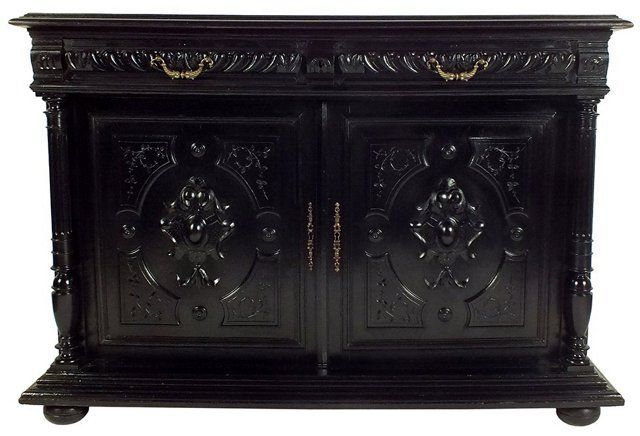 This 1880s French oak cabinet with black finish is crafted in the Renaissance style. It has Bronze handles on the two drawers, bronze keyholes stretching down the cabinet doors. The doors swing open on hinges, are accompanied by working lock and key, and are framed by two slender, carved columns. The molding around the top and bottom of the cabinet is double beveled and the doors are designed with a pattern in low relief, incorporating simplified scroll-work and delicate vines. Wear from age and use makes us love it even more. It’s an oldie, it’s a goodie and it has that touch of bronze that have designers chomp in’ at the bit. Worthy of designing a whole room around because it is just plain stunning. 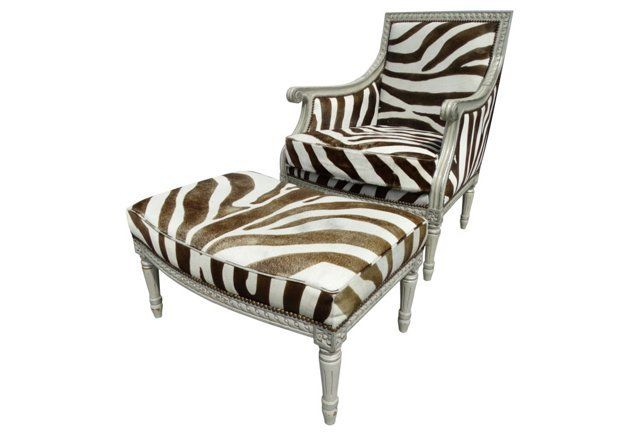 It is upholstered in zebra-print cowhide. The carved-wood frames are finished in gray with silver accents. Arms, 24.88″H; seat, 19″H; ottoman, Some scuffs on edges, feet and arms lend to the aged feel. Luxurious. Stylish. Relevant. Perfect in a man’s study or a ladies luscious dressing room. How can you not a chair that goes both ways? 28.5″L x 20″W x16″H. 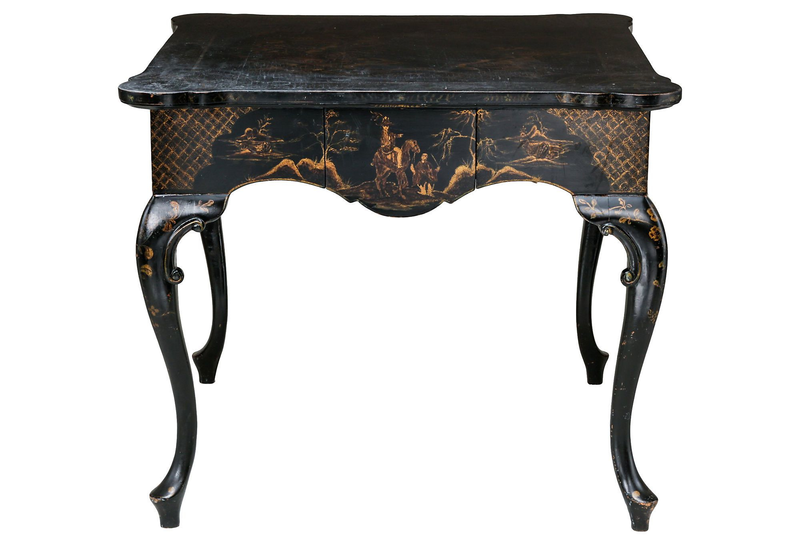 This decorative Queen Anne-style table has cabriole legs and drawers on all four sides for gaming. Some loss on chinoiserie painting heightens the handmade feel of this little treasure. Matching chairs available but who wants to match? 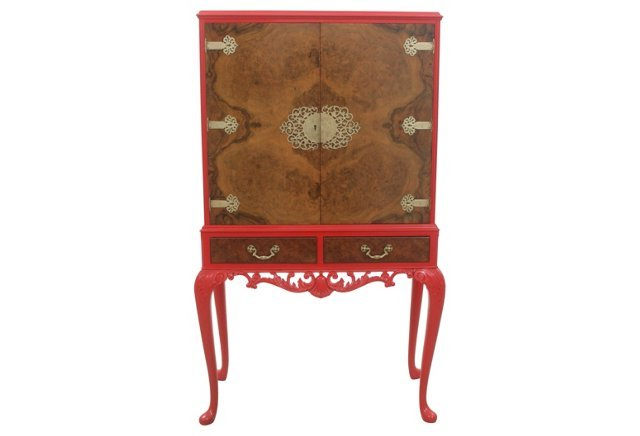 Chinese Chippendale styling gives this étagère unmatched grace and presence. The piece features four fixed shelves for storing and displaying books and accents. Could you design a room around this? Oh yeah, in fact I would build a room for this. My favorite piece EVER. 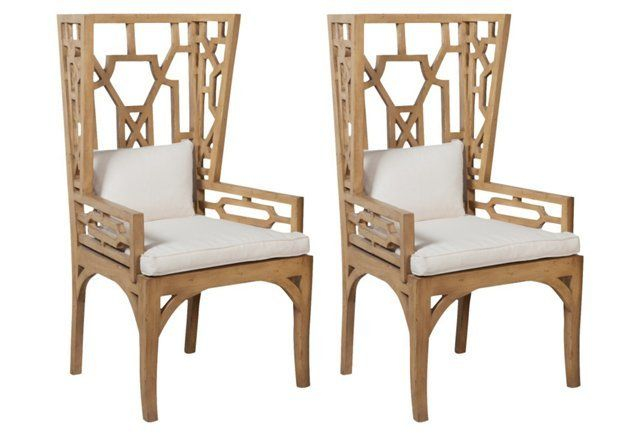 With a winged seat back, intricate fretwork, and bowed apron, these Chinese Chippendale-inspired mahogany armchairs showcase remarkable craftsmanship. Topped with crisp white muslin seat cushions they belong anywhere at anytime. 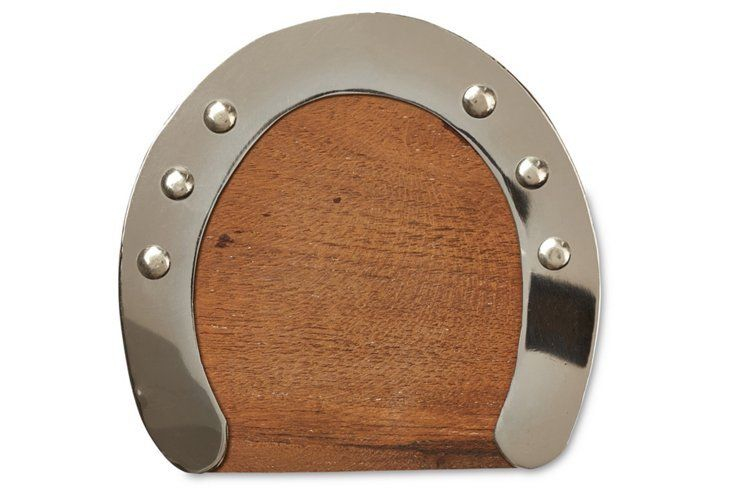 Crafted of wood with bright nickel detailing, these horseshoe coasters look as at home in an urban loft as they do on the ranch. We would not be a red blooded Kentuckian (or should I say blue blooded?) If we did not love these. Think DERBY party, Think mint julep! Want a high-end look in your home but feeling choked by your budget? Try these pro decorator tips to give your rooms a luxe look for less…. I’m always trying to help my clients find ways to make their homes look more expensive, even when they are working with a modest budget. There are lots of ways to make your rooms appear richer and more luxurious that don’t have to cost an absolute fortune. With a few well-planned moves, you can make any room in your house feel like a million bucks. 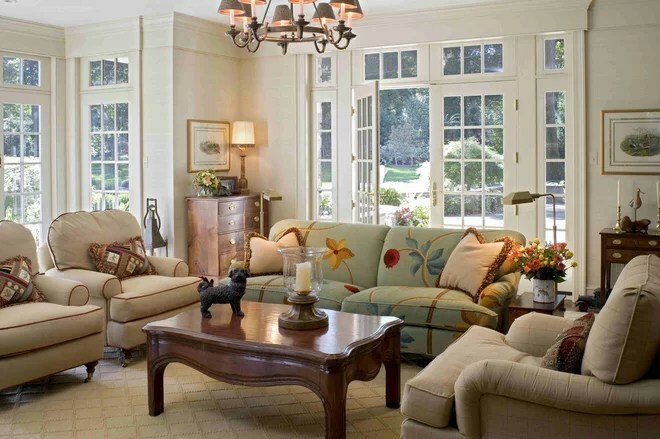 Beefing up your architectural molding can go a long ways toward making your rooms feel richer. Wider crown moulding, taller base moulding and box trim can be added. Here’s one of my favorite tricks: Install a thin piece of trim several inches below your existing crown moulding. Paint the drywall area between the two trim pieces the same color and finish as the trim. The bulkier your trim molding, the pricier it looks. Wood flooring always elevates the look of a space. No carpet or other flooring material feels as rich as a beautiful wood floor. Sure, it may cost a pretty penny, but the pretty is well worth the cost. And when you sell your home, you’ll get a big return on your investment. In recent years, Bamboo has become popular as it not only costs less, it looks fabulous AND is a sustainable building product! Throw pillows that are 18 inches or less can read store bought. Search for or have larger pillows made for your sofa — you’ll make the whole look of your living room more high end. 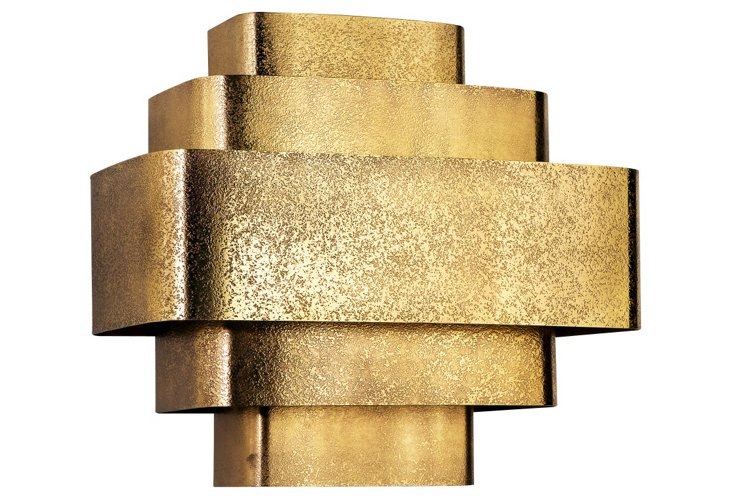 Nothing makes as much impact in a room as a new, interesting light fixture. 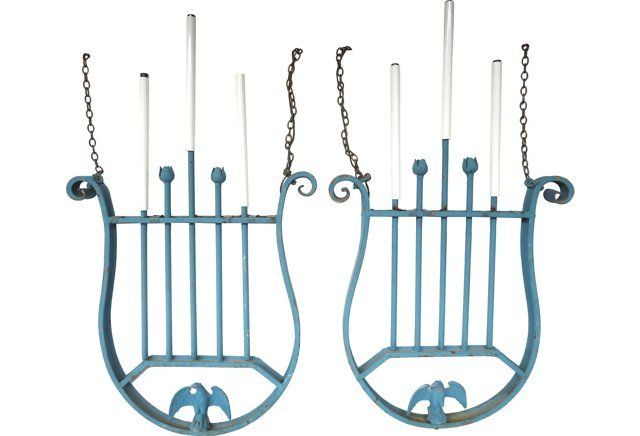 Upgrade that brass chandelier and install an eye-catching personality piece like this one. You can find a variety of great lighting at big-box home improvement stores that can give you a higher-end look for less than you think. 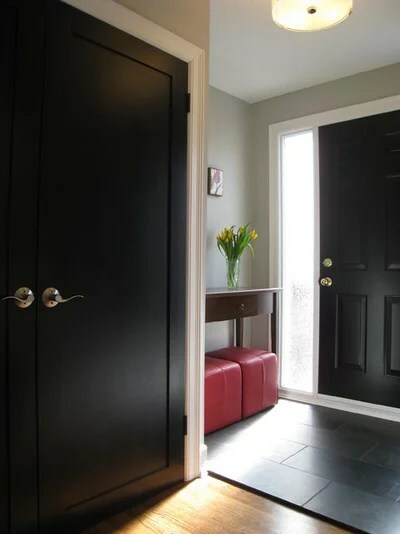 Here’s a surprise: Did you know that painting your interior doors black instantly makes your space look more expensive? 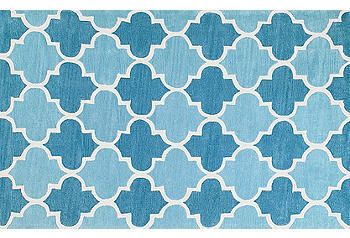 This simple change can make even inexpensive doors look like something truly special. See? Even inexpensive flat panel doors feel richer with a coat of black paint. 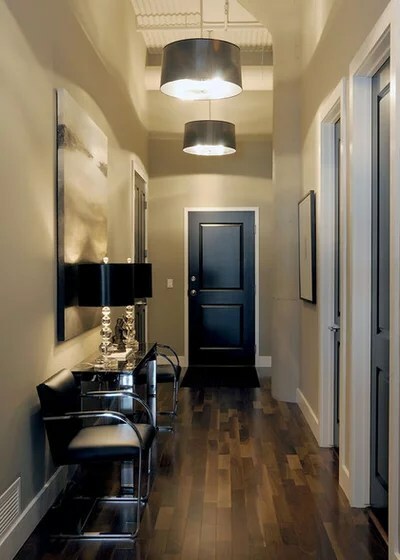 Don’t forget to add a few other black accents so that the doors tie in with your décor. What are some of your “luxe for less” ideas? 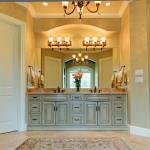 Would you like to build or remodel your dream home? Wolford Building and Remodeling has an in-house design team at no additional cost to you! The beauty of a basement bedroom lies in its versatility. For tweens and teens, it offers a measure of the privacy they crave. For overnight guests, it preserves a sense of removal from the home’s daily routine. This space even works well as an in-law suite, especially if it has its own separate entrance. You can go cozy with dark colors and heavy fabrics or your may choose to cloak the room in crisp white and colorful accents, which may be a better choice if there isn’t natural light from egress windows. 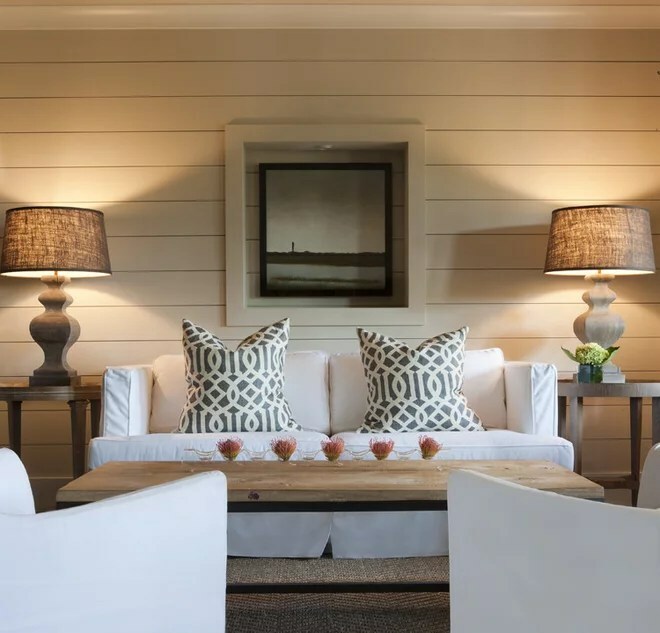 Although fewer homes these days have formal living rooms that are used only when company comes, it’s nice to have a getaway space that you don’t feel the need to keep pristine. Enter the basement: Add comfy seating; space to rest drinks, books, or games; and task lighting, and you have a multifunctional retreat just for the family. Although this space has generous windows, the pale, putty-color walls and flooring amplify sunlight and banish any hint of an oppressive feel. 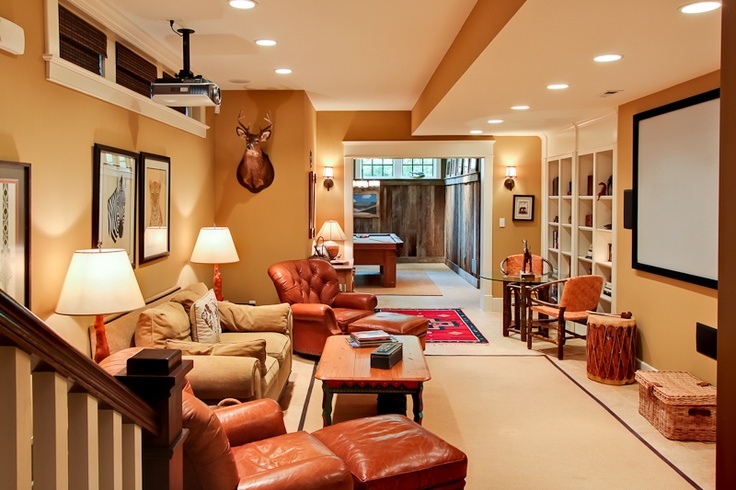 Converting a basement into a game room is a classic approach. It can be as simple or as elaborate as your tastes and budget allow—this one has bells and whistles aplenty, including a pool table and full bar. Because it’s typically not seen from the rest of the house, a basement is also an ideal place to take a design risk, such as carpet or interesting curtains. If you’ve ever had to tote clothes to the laundromat or venture out to a garage washer/dryer on a chilly morning, you know what a luxury it is to have a dedicated laundry room in your house. 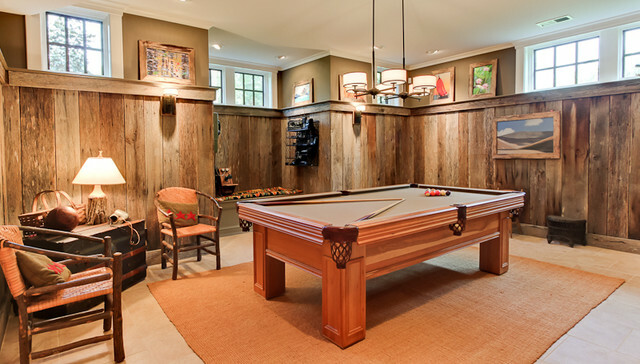 A basement can be just the spot to carve one out, especially if plumbing and electrical systems are already in place. It doesn’t need to be huge, but some simple amenities—a fold-down ironing board, a sink for soaking stains, a counter for folding, and cabinets for storage—make doing laundry a pleasure (almost). 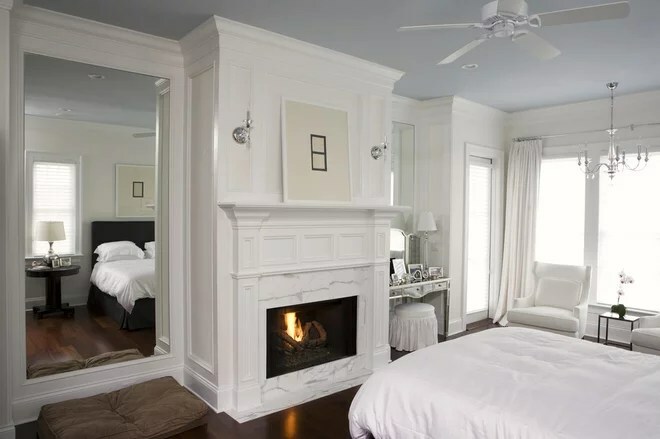 Sure, you can sip cocktails in the living room or pour wine from the kitchen island, but the nice thing about basement entertaining quarters is that you won’t disturb kids and light sleepers if guests linger until the wee hours. This appealing space is proof that it doesn’t need to be elaborate; a cushy seating area and a simple built-in bar are all it takes to get the party going. 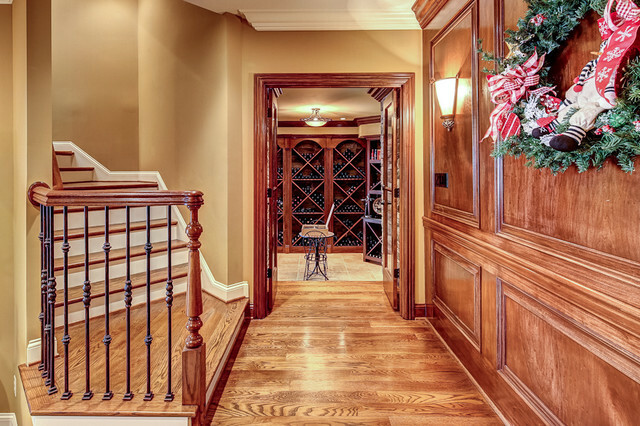 If you’re serious about wine, you’ll want a serious room for it. A custom-crafted cellar keeps your collection at the right temperature so that every bottle is ready to enjoy when it’s time. Make it even more functional with a tasting area and a full dining area so that you can enjoy your prized vintages with meals that show them off at their finest. A what? If you have the room and resources to spare, why not indulge in your very own bowling lanes? It may not guarantee you a strike every time, but it’ll ensure that your house is the hot spot for rainy-day fun. Of course, you can tailor this idea to your particular passion: Install a rock-climbing wall, full home gym, mini putting green, home spa, or whatever indulgence you fancy. 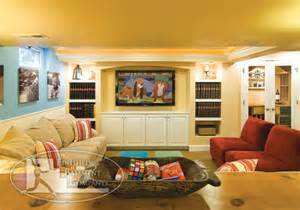 WHAT ARE SOME IDEAS FOR YOUR BASEMENT?